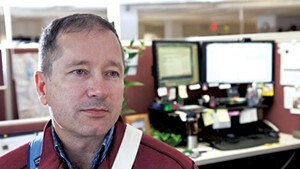 Brant Goode is a nurse epidemiologist at the Vermont Department of Health. 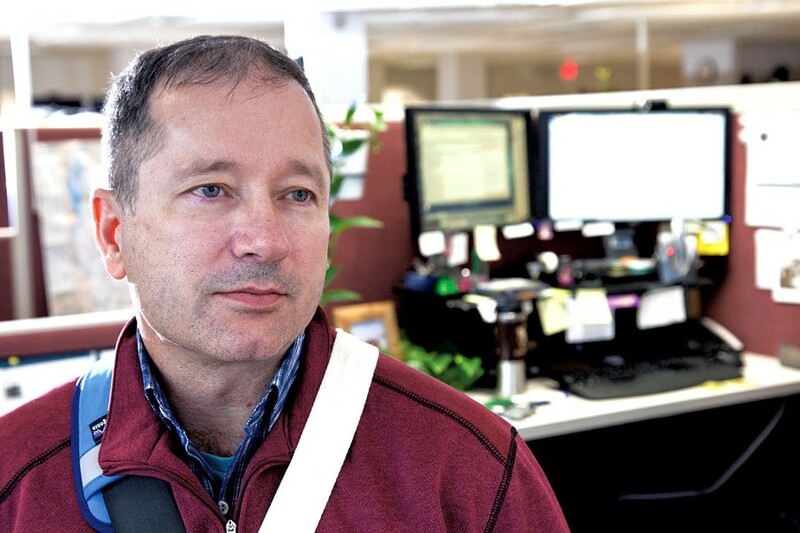 On a typical day, the 54-year-old father of two might analyze flu trends or help plan a pertussis vaccination effort. Last Friday was not a typical day. Goode flew to Monrovia, Liberia, where he'll spend the next month helping to contain an epidemic that has killed more than 2,600 people in four countries. West Africa is experiencing the largest Ebola outbreak in history. The virus, which doesn't have a cure, has for more than six months been ravaging a region ill-equipped to fight it. A week before he left, Goode, wearing glasses and a phone clipped to his belt, didn't appear any different from his coworkers working quietly at their cubicles in the health department's Burlington headquarters on Cherry Street. That is, until he pulled out a chart showing the number of Liberian health care workers who have died from Ebola since the start of the latest outbreak: 79 as of September 6. "They've been decimated," Goode observed, noting the country's health care system wasn't robust to begin with. Prior to the outbreak there was just one doctor for every 100,000 people. Dressed in jeans and a navy blue polo shirt emblazed with the U.S. Public Health Service logo, Goode explained the ravages of Ebola in the manner of someone used to distilling wonky topics into simpler form. The disease manifests itself in fevers, headaches, vomiting, diarrhea and, in the worst cases, internal and external bleeding. During the current outbreak, the virus has killed roughly 70 percent of the people who've contracted it, according to the World Health Organization. Though he rattled off these statistics with the ease of someone who's spent a career steeped in data, Goode was clearly moved by the meaning of the numbers. On September 16, President Barack Obama announced plans to send up to 3,000 U.S. troops to help contain the epidemic. WHO director-general, Margaret Chan, has issued a worldwide plea for more doctors, nurses and supplies. "The thing we need most is people," Chan said. "The right people, the right specialists, and specialists who are appropriately trained and know how to keep themselves safe." A public health nurse for the last 25 years, Goode didn't hesitate — even though he has never worked overseas. He responded back in July to the first call from the Atlanta-based Centers for Disease Control and Prevention. "I understood enough about the bug, about how to prevent it and control it ... It's big and it's bad, and there is a huge need." He said his wife and his two adult daughters are supportive of his decision. His younger daughter also works in public health, and has expressed interest in volunteering. Before he could go, Goode had to get permission from Patsy Kelso, the state epidemiologist for infectious disease. Kelso said she wasn't surprised by his request, because "it's in his nature to want to help." Though he's been at the Vermont Department of Health for the past five years, Goode is technically a CDC employee. He's one of 33 epidemiology field officers positioned around the country to help cities and states prepare for possible public health disasters. The program began after the September 11 attacks stoked fear of widespread bioterrorism. "Fortunately," Goode reflected, "we haven't had to do a whole lot of that." Which isn't to say his work — even in Vermont — has been uneventful. When radioactive tritium at Vermont Yankee leaked into the groundwater in 2010, Goode created graphs to map the spillage, and he'll likely play a role in the projected decade-long decommissioning of the nuclear power plant. In 2011, as Tropical Storm Irene ravaged Vermont, Goode helped monitor the state's health care infrastructure — making sure hospitals were on the lookout for waterborne illnesses. Before coming to Vermont, he dealt with an E. coli outbreak at a petting farm at a state fair in North Carolina. Now in Liberia, along with a team of three other CDC officers, Goode isn't involved in direct patient care, but rather is training health care workers to protect themselves against the virus. "The probability of coming into contact with those who've been exposed is there, but I know how to protect myself," Goode explained before his departure. Ebola is spread through direct contact with blood, saliva or other body fluids. A defining image of the crisis has been health care workers wearing space-suit-like gowns to protect against the virus. But preventing infection isn't as simple as putting on a protective suit, Goode explained. He will teach people how to properly "don and doff" the suits — a process that involves two people and two separate rooms. Another, even more basic, instruction: "You may have sweat running into your eyes: Don't rub it." Leading up to his trip, Goode said, he spent his spare time reading up on Liberian politics and customs in an effort to be "culturally competent." In this situation, the stakes are high: Last week in Guinea, a mob murdered eight health workers and journalists who local residents believed were spreading Ebola to their village. 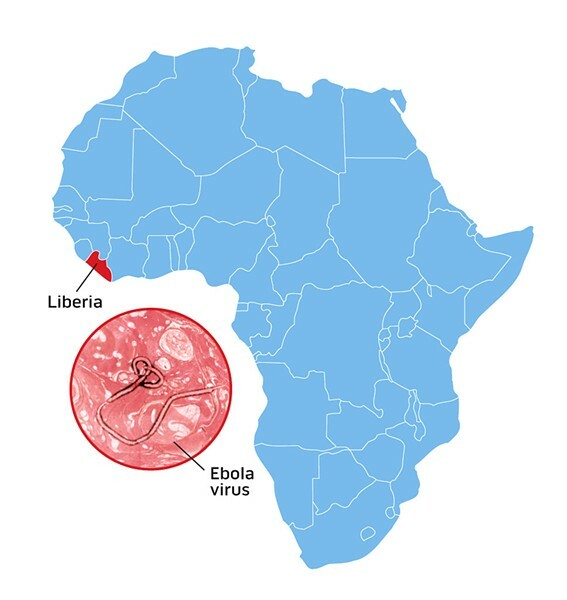 In Liberia, similar conspiracy theories have hampered efforts to contain the virus. "A deployment for a month, while not a bad thing, is short compared to the need," said mild-mannered Goode, who lives in Burlington. Explaining his decision, he said simply: "I don't want to see more people die." "He doesn't toot his own horn, but we are proud of him," Kelso said, adding that she wouldn't be surprised if some of his Vermont coworkers were unaware of his medical mission. "He's willing to represent us over there in this very challenging work ... Speaking for myself, anyway, I'm not sure I would be willing to put myself in harm's way like this." Kelso and Goode have both been involved in Vermont's efforts to prepare for Ebola. No, the Green Mountain State isn't stocking up on disinfectants and distributing hazmat suits, but the health department is making sure hospitals, ambulances and other health care players know what to do if they encounter a patient with Ebola. On a whiteboard at the health department, someone had jotted down a phone number and pass code, with the word "Ebola" written above it — they've been participating in weekly conference calls with the CDC. "It's a global society," Kelso pointed out. "Vermonters travel all over the world and people from all over the world come here, so we could have someone infected with Ebola or who had been exposed to Ebola ... end up in Vermont." Kelso said the health department has been advising Vermont colleges how to handle students returning from Liberia, Sierra Leone, Guinea and Nigeria — whether to put them in single or double dorm rooms and how long to monitor them for fever symptoms. But Kelso and Goode were also quick to offer assurances that Vermont's health care system would be capable of addressing and containing an Ebola case. Goode, who is partial to public health-related metaphors and described his work as one component of the community's immune system, noted that, "Immune systems can overreact at times and cause problems ... so there's vigilance and then there's hypervigilance." Experts have said the likelihood of a global outbreak is very slim. Three days after landing in Liberia, Goode wrote in a brief email, "I participated in infection-prevention trainings today for a facility that had recently closed after infections spread to several staff ... They plan to resume operations as soon as they've become more prepared to deal with Ebola." The U.S. military presence is visibly growing, according to Goode.